KUALA LUMPUR (Reuters) - An Indonesian woman accused in the 2017 chemical poison murder of the North Korean leader's half-brother was freed on Monday after a Malaysian court dropped the charge in a case that drew suspicions of being a political assassination. "I feel so happy. I did not expect that today I would be released," Siti Aisyah said, adding that she was healthy and had been treated well in prison. 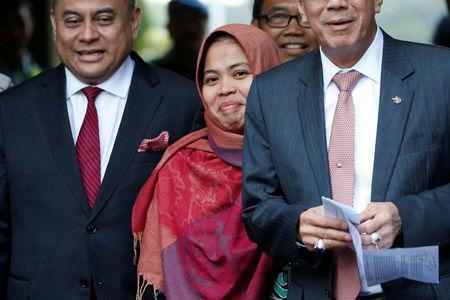 While the court discharged Siti Aisyah from the case, it rejected her lawyer's request for a full acquittal, as it said that the trial had already established a prima facie case and she could be recalled if fresh evidence emerged. "I still believe that North Korea had something to do with it," Gooi said. Kim Jong Nam had lived in exile in Macau for several years before the killing, having fled his homeland after his half-brother became North Korea's leader in 2011 following their father's death. Some South Korean lawmakers said the North Korean regime had ordered the assassination of Kim Jong Nam, who had been critical of his family's dynastic rule. Pyongyang has denied the accusation. Left to stand trial by herself after Siti Aisyah's release, Huong was still sobbing as she prepared to take the stand on Monday at the start of her defense. But the court agreed to resume proceedings on Thursday instead, pending a reply from the attorney-general to the request that charges against her also be withdrawn. "Where is the principle of equality? Both of them were charged on the same evidence, the defense was called on fairly the same grounds," said Salim Bashir, one of Huong's lawyers. "Until today, we do not know what were the exceptional circumstances that were needed for the attorney-general to review the charge against Siti Aisyah. The prosecution never advanced a single ground for the withdrawal." Siti Aisyah's trial was suspended in December as her lawyers argued with prosecutors over access to statements made by seven witnesses. Prosecutor Muhammad Iskandar Ahmad told Reuters the decision to withdraw the charge against her was made based on "several representations", without elaborating. Laoly said Siti Aisyah's release, after over two years in prison, was the result of high-level diplomacy by his government, including meetings with Malaysian Prime Minister Mahathir Mohamad and the attorney-general. "After studying the case thoroughly, we sent letters to the Attorney-General of Malaysia and met with him and Prime Minister Mahathir last August," Laoly told reporters with Siti Aisyah shortly after landing in Jakarta. Laoly had written to Malaysia's attorney-general, laying the blame on North Korea. "Miss Aisyah was deceived and had no awareness whatsoever that she was being used as an intelligence tool of North Korea," he wrote.